You may remember my post on Bigelow's Aerospace inflatable space station plans. An experimental inflatable spacecraft bankrolled by real estate magnate Robert Bigelow rocketed into orbit Wednesday to test technology that could be used to fulfill his dream of building a commercial space station. The Genesis I satellite flew aboard a converted Cold War ballistic missile from Russia's southern Ural Mountains at 6:53 p.m. Moscow time. It was boosted about 320 miles above Earth minutes after launch, according to the Russian Strategic Missile Forces. The launch was a first for the startup Bigelow Aerospace, founded by Bigelow, who owns the Budget Suites of America hotel chain. Bigelow is among several entrepreneurs attempting to break into the fledging manned commercial spaceflight business. More on the project can be found here. Lets hope the inflation goes well. 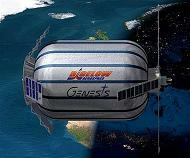 5:20 PST Bigelow Aerospace has received confirmation from the Genesis I spacecraft that it has successfully expanded. We have also confirmed that all of the solar arrays have been deployed. 4:15 PST Bigelow Aerospace mission control has begun to acquire information from the Genesis I spacecraft. The ISC Kosmotras Dnepr rocket has flawlessly delivered the Genesis I into the target orbit of 550km altitude at 64 degrees inclination. The internal battery is reporting a full charge of 26 volts, which leads us to believe that the solar arrays have deployed. The internal temperature of the spacecraft is reported to be 26 degrees Celsius and we have acquired the spacecraft's Global Positioning System (GPS) signal that will enable us to track the ship in flight. We have initiated communication with the ship's onboard computers and expect to download more information over the next few hours. Keep a watch on the Bigelow website for the latest.